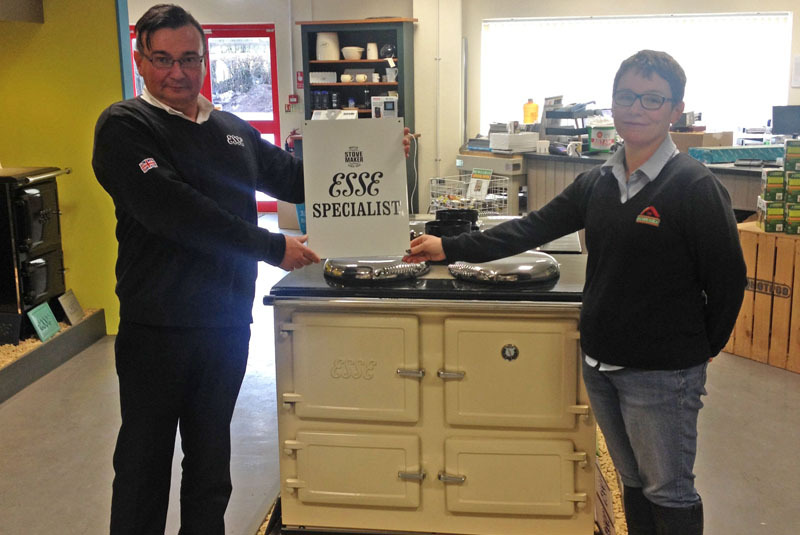 Hay-on-Wye specialist heating and cooking retailer Huws Gray has received official recognition for outstanding customer service from Master Stove Maker ESSE. ESSE’s sales team is currently touring the UK distributing high quality external ‘ESSE Specialist’ signage in recognition of dealers who have ‘gone the extra mile’ in providing outstanding levels of customer service during 2017. South West sales representative Dan Blewitt presented the high quality enamelled sign to Diane Workman at her Powys showroom. Handing over the sign, Dan said: “ESSE products are designed and built with a care and attention-to-detail that has helped us to become the authority in stoves and range cookers. That’s why we feel that ESSEs should be showcased, sold and installed with the same diligence. Hay-on-Wye-based Huws Gray carries a wide selection of ‘live’ demonstration models from ESSE’s EL13 and 990 range cookers plus the ESSE log burning stoves. ESSE has been hand-building range cookers and heating stoves since 1854 and its products have been relied upon in some of the world’s most demanding settings: from the kitchens of the Savoy to the Houses of Parliament. All ESSE products continue to be built in the UK.